Paul Rose has made exploration his lifelong career. The exploits of this dynamic professional diver, polar guide, mountaineer, expedition leader, yachtsman and instructor traverse Antarctica, Greenland, and several oceans. Driven to discover and experience the Earth’s wonders at first hand, he is also motivated to share his adventures and observations in some of the planet’s most extreme places as an author, television broadcaster and public speaker. Rohantime tracked him down just before jetting off to the Seychelles. Climate change fact or fiction? Fact for certain. The climate has always been changing due to natural variability, but things are different now because it’s us that is driving up the temperature of the planet. Manmade greenhouse gases are heating up Earth. There is no doubt about it! In your view with the recent events in Pakistan and China and the disturbed water patterns across the globe are we actually witnessing the effects of climate change. Yes, because our warmer temperatures do contribute to heavier rainfall. Plus at the same time as the floods in Pakistan and rain induced mud-slides in China, we’ve had the heat wave in Russia. It is not just a coincidental connection that they are happening at the same time. One problem in our understanding of climate change is when every single weather anomaly is attributed to global climate change. More than ever, we need to think about the responsibility of clarity of our science reporting. In your exploration what did you see that affected you most about the scale of change we are causing? The ozone hole. And our understanding of climate change. I remember receiving a message from headquarters in the 2001/02 season that something was happening at the northern end of the Antarctic; they could see it on the weather satellite. I got up there in an aircraft and, sure enough, there was a huge piece of the Larsen B Ice Shelf floating off. I was seeing huge ice islands that I used to think of as mountains just breaking off from the mainland and drifting out to sea, right in front of me. This is climate change in action. Are you a pessimist or an optimist with regard to our collective response to climate change? I am very optimistic about our future sustainable development. Many of us now have the will and technology to protect our ecosystems and improve the way we all live. It’s an awesome repsonsibility and we can do it. But there is a lot of work to do! Have drastically slowed down the human effects on our climate and made sensible, sustainable adaptations to the changes that are happening now. Have reduced our rate of population growth to sustainable levels. Have protected our ecosystems and biodiversity. What one single act by each and every person on the plant, in your view, would make the biggest contribution to climate change? Can we give our planet 30 minutes every day? Why not dedicate 30 minutes to understanding our environment. For instance; Search the net for climate change reports, read the latest updates from The Royal Society and the World Meteorological Organization, ask questions on climate change web forums, get together with the family or colleagues and have a proper discussion – or even an argument about it! Read the newspapers with a keen eye for environmental matters, and Use resources like “ispot” regularly. Or accumulate the 30 minute daily sessions into longer sessions. Encourage family and friends to be “citizen scientists” and work alongside top environmental scientists on projects such as Earthwatch. Take an active part in local environmental activities; Beach, park, river and pond clean-ups. If we all do one of those things every day we will be better informed and be able to make meaningful decisions about our future. Just the journey in understanding nature improves our lifestyle. There are no excuses. We must do it. Everyday. We notice you have recently been to Greenland. There is more farming land available in Greenland every year because of the higher temperatures and less snow. How long do you think it will be before there is no snow? Greenland is changing fast. I have been working there every summer since 2002 and have seen changes in the past eight years – melting glaciers, changes in the mountain snow and ice conditions, massive warming on the ice cap. The images of ice mass changes are extraordinary, and are very powerful evidence of the fast melting. But it’s impossible to predict when or if there may be no snow and ice. What we do know is that within our lifetimes the Arctic will become unrecognisable from what we see today. Short-term winners are the Greenlandic farmers. I remember paying $10 for the last cabbage in an Ilulissat shop in 2002. At least they should be cheaper now! When you go shopping do you look for the more sustainable goods and services and buy them? Absolutely. It makes a difference because every time we buy things that are sustainable we are sending a message to the suppliers, manufacturers and investors. It’s essential that we make informed choices. For instance, I see a lot of people using the sustainable fish guides produced by MCS (Marine Conservation Society). Do you think producers of our goods and services are doing enough to reduce their carbon footprint? If your answer is no. What is the biggest barrier? Some businesses are most certainly doing enough, many others are doing their best and some have no interest. It requires some balance to get this right because we need the energy and influence of profitable business to power essential environmental changes in policy makers and leaders. So we can’t just stop or pause business until we get things perfect. The biggest barrier to business reducing carbon footprint is the cost. Let’s face it, to upgrade industrial plant, change production techniques, source supplies differently all costs money. But as consumers and investors become even smarter about where their money goes, it drives business into making sustainable decisions. You have done so much over the years in the outdoor environment, which activity is your greatest love? Diving! I grew up in Elm Park, Essex and was generally hopeless at school. I remember the early 1960s when my life’s heroes were in their prime; Hans Haas was using military diving gear to film his fabulous shark documentaries; Mike Nelson was up to his neck in Sea Hunt adventures saving downed jet pilots, and beautiful women were hiring Mike for diving lessons; and Jacques Cousteau had invented SCUBA diving, written the Silent World and was exploring the world’s seas on the ultimate diving expedition on Calypso. I had just failed my Eleven Plus, hated school, loved the sea and knew nothing. Except that I wanted to be a diver. I can still feel that first dive in 1969; sideways rain/sleet on Chesil Beach, Portland, pulling on my homemade wet suit (black with yellow tape of course!). Carrying the boat, the outboard engine, fuel and all the gear across the stones, heading out a little way and then – rolling into the sea. You know I really can still feel that moment. 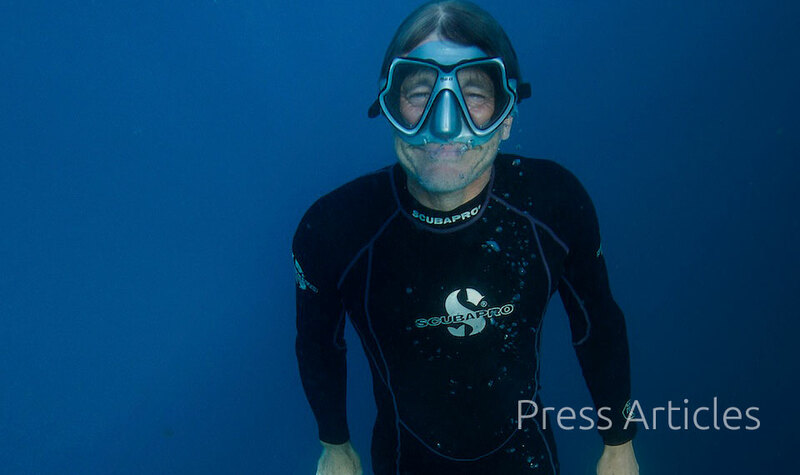 It was clear water, I could see the bottom which was about 10 meters, the cool sea rushing into my wetsuit, the fabulous sense of vitality. I was finally a diver. And still am! What would be your advice for the next generation of young adventurers, and what opportunities remain for them? I say to young explorers: get out there and see it for yourself, climb those peaks, run those rivers, cross those deserts, sail that ocean. I’m doing everything I can to encourage the next generation to get out there, feel it and do it, to touch it themselves. To write about it, talk about it, share it with others. This is one of the most powerful ways of understanding our planet. I have a huge amount of faith in our next generation. It’s all to go for. Many people have dived like I did, crossed the ice caps or reached the tops of many mountains. But I say to the coming generation: go and do it for yourself. You have to ground-truth it, experience it for yourself. We may understand a lot about our planet, but still the greatest experience is to go and stand on it, walk around it, swim in it, touch and feel it, climb it, wiggle underneath it, get cold, hot, lost, eat whatever comes, be frightened and exhilarated! ask him how to get on an expedition. I read it manyyears ago and now offer it as advice. There are plenty of perfectly sea worthy boats and well fitted out expeditions that aren’t “quite ready yet” so never leave. The best thing is to do whatever preparation and planning you can afford to and then just go! What oceanic horizons are there still to be explored? Tell us a bit about your series for the BBC? the land would be 800 metres high and the oceans would still be 3,800 metres deep. It’s a vast, almost immeasurable space and less than 10 per cent has been explored by man. There is a lot to learn. I am in the middle of making my new BBC series, the working title is Oceans:UK. It’s a great follow-on from Oceans and of course it feels wonderful to be diving in UK waters. I’ve been at it since June and should have it all finished by autumn. Looking at a map you could be excused for thinking that it’s been planned by a lunatic, because we have been criss-crossing the UK to be at the right place at the right time. We need to find the sea beasties and make sure the marine science contributors are available, weather and sea conditions need to be workable, plus we have to shuffle crew, boats and equipment availability. I have the easy bit – dive and report. It’s the behind the scenes team at BBC who have the real challenges! You’re job seems to cover so many areas. If someone asked you at a party, what you do, what do you tell them? But if the setting is a little quieter then obviously I can make a more thoughtful reply. My work is very varied which is great. In a career packed with adventure, exploration and discovery, what have been the high points for you? Unquestionably being Base Commander at Britain’s Rothera Research Station in the 1992 to 2002 was a career high point. To have the finest scientists and best support team in the world, what a challenge and what an honour. Being at the very end of the world’s longest supply chain, doing the world’s most challenging science. What were the most memorable discoveries made during your time in the Antarctica? So many; all of the British Antarctic Science divisions made significant discoveries every season. It’s very energising to work with people who really are at the front line of earth science discoveries. It felt to me that climate science really took off in the late 90’s and then became more visible to the public eye after the 2001/02 Larsen Ice shelf break up. The marine science team re-wrote our understanding of Southern Ocean resources and recorded a mass of new species discovered from the diving supported projects at Rothera. I remember the day when one of my field teams managed to drill through the Ronne Ice Shelf. They’d spent years trying to get through it with a hot water drill. We were really excited because we’d overcome a great technical challenge. All you can see now is an upside-down barrel in this great white expanse. You lift the drum up and there are some instruments in there, measuring the flow of Antarctic bottom water that is one of the very important drivers of the world’s ocean currents. It was a hugely complicated, wonderful piece of world-leading research. We had a good celebration the day we got the news back at the Base that they had made it through. It sounds like an exaggeration – but yes, every year Polar science makes new discoveries that change the way we understand the planet. What was it like diving in Antarctic waters? Diving is one of my great loves. 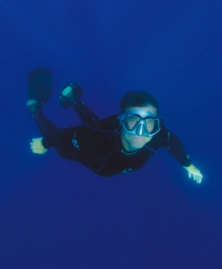 It is wonderful to dive with the world’s best marine scientists, then come up to the surface and say: “Hey, what was that, we just saw?” and have them reply: “I don’t know.” I can barely describe the feeling to be among the first people in the world to make new discoveries underwater. The sea temperature is about –1.5C, so we used drysuits of course and you can wear good insulating clothing underneath them. It’s only my hands that would get cold sometimes and also the longer shallow dives made you much colder than the short deeper ones. Diving under Antarctic ice is a tremendous experience and coupled with being in support of the science I would have to say it’s the ultimate diving experience. Have you experienced any terrifying moments? Oh yes; it’s impossible to not to have a fair share of it – but it’s essential to keep your personal risk management and controls in check so that you can prepare and react to real risks without getting into terror! I would say that it’s good to have a good sense of appropriate, healthy fear. It keeps you alive. I did have one particularly memorable risky dive; diving in the open water in the Antarctic is safe. And diving through the ice is also safe as it’s a relatively stable environment. But when the ice is moving, it’s very tricky. It may seem simple to plop down through the brash ice, but it only takes a bit of wind or current a long way away, and it can tighten the loose pack together and make it very difficult to get out. One day, we were diving to recover a lost piece of equipment. The water was quite murky and we swam in circles, searching, until our air was getting low. As we rose 30 metres off the bottom, we banged out heads. A large iceberg had come up on the current and run over our position. It was a horrible moment. I could see our safety line going off at a sharp angle. So we followed it, very worried. We only had so much air. I was thinking: “Holy smoke, this is a huge iceberg that’s gone over us.” Under the berg were great fissures and shapes in the ice, things of great beauty — but the beauty was lost on me: I was keen to get out. We left the line and kept going, swimming around all the shapes. As we came up, I wondered if it was the surface — or a huge cave in the berg. We came up and were delighted to see it really was the surface. I remember looking at our boat crew — and they looked a lot worse than we did! The cup of tea back at base felt pretty good, I must say. Who or what inspired you to take this route into scientific exploration? I shone at three things in school – trips away from school, sports and metalwork. Those classrooms were not for me; overheated – I can still smell the hot paint on the radiators. Stale air. Always waiting around. Assembly. Teachers who were only interested in the bright ones. Uniforms. Incomprehensible and dull lessons. I was so bored and full of diving and motorbike dreams that one day I forgot what a margin was and to the delight of a particularly terrible teacher, put my hand up to ask. And then when I was 14 my Geography teacher stepped outside of the classroom and all the horrors that it held for me, and took the class out to the Brecon Beacons. I remember that as we got closer to Wales he became less of a teacher and more of a mountain enthusiast. This grey, heavy, lumbering teacher in bad clothes transformed into a bright, smiling, solid, cagoule wearing, inspiring man. I fell in love with that man and the way he shouted at some of the bright lads who were cruising school but were clueless in the outdoors. I was bursting with pride when he bellowed “You’ll lose your life down there boy!” at one of them as he tried to escape the wind on a high ridge by running down an obviously terrible gully. I almost wept when he saw me doing well and told me so. I shall never forget how alive and in-tune with nature I felt those days peeling spuds at the Merthyr Tydfil Youth Hostel after a day in the hills. During Voyages of Discovery you told the dramatic tales of men including Cook, Magellan, Nansen, and Mommsen who set sail into the unknown and made scientific discoveries that changed our world forever. What are some of the ways that their voyages—most of them so long ago—influenced the modern world? The Earth is round! And we know how big the Pacific is and how to get there – Magellan. If you have vitamin C and fresh food you don’t die from scurvy. And we know how far it is from the Earth to the Sun – Cook. We know how to not get malaria. We know the shape of our earth (fat in the middle). We use condoms, tires, windshield wipers. And it’s not a good idea to spend a great chunk of expedition money on girls! – La Condamine. There is no land mass in the far north, the far north is a frozen sea. Cross country skis as we know them today. Water sampling equipment still called “Nansen Bottles” and sledges we all use in the Antarctic still unchanged and still called “Nansen Sledges” – Nansen. Mixed gas diving which we use routinely in commercial and recreation diving. Submariners are no longer called the “Coffin Service” – Momsem. How did these explorers make do without the technology and sophisticated equipment available today…or, on the contrary, did they have some advantages over today’s explorers? This is one of the brilliant things – they were all using what was the finest technology of the time. And yes – I think they did have some advantages, for instance – life not on an expedition could be pretty hard in those days, so expectations on the expedition were different than they are today. I am awed by the resolve these voyagers handled disappointment. They just kept going. There was no way that quitting was an option in their minds and they went to impossible levels of commitment and discomfort to keep their dream alive. For example; imagine arriving at the eastern side of the Pacific after a hellish winter on the South American coast which included a mutiny, then searching and finding the way through what is now called the Straits of Magellan, and then expecting the Pacific to be about a week of sailing, only to find out by doing it that it was 100 days! How are ocean voyages of discovery different from explorations by land or in space? Because the oceans are so vast – 70% of the planet surface and 99% of the living space on Earth, there is a sense of scale in sea voyages that is above land journeys. And because of that, early sea voyages really do have an affinity to our space explorations now. What would be your next dream adventure? Going into Space! That’s my dream – working up there on a space-walk and looking out into the immeasurable blackness and beauty of “outer space” and then looking back to our beautiful blue planet. If I don’t have time to do that then it will be the deep ocean abyss. It’s another dream to follow Jacques Piccard and Don Walsh’s dive to the bottom of the Marainas trench in their bathyscape, Trieste. What has been you career highlight or favourite moment, and why? In 1999, I was honoured with the Queens’ Polar Medal for developing Rothera Base from a field station with quite a lot of men and a large number of dogs into a proper scientific research station. I brought in the diving, and we developed proper laboratories. It was a beautiful career high point to receive my medal from HM The Queen at Buckingham Palace. Filming the new BBC series will take until about the end of September. I leave for Antarctica in mid-November through to the end of January 2011 in support of a Scripps University science project in the Dry Valleys. I was there last year and we have this coming season and the next to complete our field work. We are gathering ancient methane trapped in the ice as part of a climate science project. Next year I’m leading more Arctic expeditions including climbing in the Watkins Mountains in Greenland and also a sailing, climbing and diving expedition to Iceland, Jan Mayen and Greenland. You must have worn a great deal of outdoor clothing over the years. What do you think have been the greatest innovations in outdoor fabrics and clothing over the years? It’s been a combination of the introduction of breathable and lightweight fabrics for rain and windproof gear along with fast drying base layers. Plus, of course, clever use of pile type fabrics for mid-weight and insulation layers. In the past few years there has been a bit of a “revolution” back to natural fabrics; wool, cotton, goosedown. So, we are now blessed with being able to make choices and can have a set of gear for every eventuality. What kit clothing and equipment are you most attached to? ‘Elacin’ made-to-measure earplugs! They are just brilliant and I highly recommend them. Not cheap, they cost about £100 and you can get them from hearing specialists. Perfect for sleeping on noisy boats, in storm–bound tents or airplanes. I always travel with them and I rarely travel without my Swiss Army knife and multi-tool. I do the same things as I do for work minus the desk based bits! I love to move around alongside nature – so I travel, dive, sail, climb, ski, cycle, run, walk, canoe and go caving. I enjoy being as fit and as injury free as possible, so I use the gym and get physiotherapy sessions regularly. I love to read – my house was once described as a cross between an outdoor outfitters and a library. Oh – I’m a dead keen dancer, I’m not good, but am very enthusiastic about it! Do you think you will ever want to retire? Not in what might be called the classic style of retiring as I haven’t had an actual “proper job”, meaning regular hours etc, for over 30 years. But as time passes I might just be a bit fussier about what work I take on. I need to keep gaps in the diary for getting into Space and down to the Maraianas Trench. Is it good to come home to The Lakes? Yes! It’s brilliant being based up here. I have a good house with great views of the hills and Lake Windermere. I also have my lovely Corribee sailboat on my mooring in Lake Winderemere. She’s beautiful and I do some of my best work on her – in fact, I’m writing this on her now!